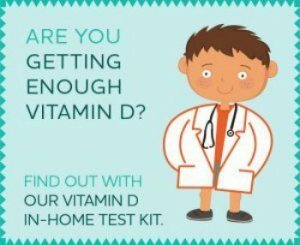 Vitamin D for cold and flu symptoms? Using Vitamin D for cold and flu symptoms is an underused, effective natural immune boosting strategy. Vitamin C and zinc have been getting all of the press lately about colds and flu, but Vitamin D and the flu is a real winner too. A well organized study that followed over 100 postmenopausal women for 1 year while they were taking 4000 IU of Vitamin D daily, had only one women get cold or flu symptoms IN THE ENTIRE YEAR! That’s ONE cold in ONE year in over 100 women By the way, that was NOT one cold PER PERSON for the year, that was ONE COLD FOR 100 people. How many total colds do you and 99 friends get every year? 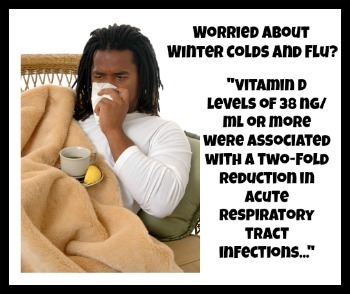 Another study entitled Serum 25-hydroxyvitamin d and the incidence of acute viral respiratory tract infections in healthy adults found that when levels of Vitamin D were at or above 38 ng/ml, that the incidence of colds and flu were cut in half. A large scale study that reviewed the current literature also found that Colds and Flu Were Reduced in Those Taking Vitamin D Supplements. 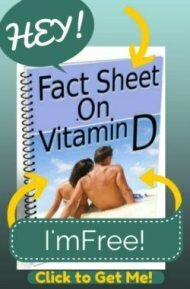 Not surprisingly, the people most protected were those with the lowest levels of Vitamin D.
Vitamin D is a potent Immune System stimulant, as we discussed on the main Vitamin D Facts page. One of its immune system functions is to help trigger production of a substance called cathelicidin. 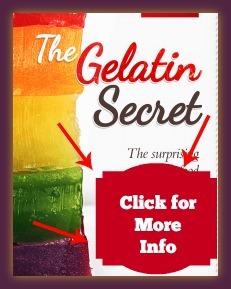 Cathelicidin is a naturally produced antibiotic that is able to be made only in the presence of high Vitamin D levels in the bloodstream, higher than the vast majority of the population has. Thus Vitamin D for cold and flu symptoms could also be a possible treatment for colds and flu, according to some researchers. There is much more Vitamin D Research that connects lower Vitamin D levels to a higher rate of cold symptoms in children and adults- like This February 2009 Article from the Archives of Internal Medicine. It's also well known thatChildren with Rickets (severe Vitamin D deficiency leading to bowed bones) have much higher incidences of respiratory infections. Another reason that Vitamin D for cold and flu symptoms may be effective, is that Vitamin D Deficiency may contribute to periodontal disease. And Periodontal Disease- by pouring large amounts of bacteria into the bloodstream- is a serious drain on the immune system. When the immune system is already working overtime, it's not going to be able to fight off colds and flu effectively. So a combination of using Vitamin D Supplements and Correcting Periodontal Disease by having excellent Oral Health and Hygiene could be a serious One-Two Punch for Seasonal AND even Swine Flu Prevention. Can Vitamin D affect the rate of flu symptoms and even stave off epidemics? One comprehensive Vitamin D research paper, ‘On the epidemiology of influenza’, theorizes that Vitamin D and the flu may be even MORE closely linked. The study says that a low Vitamin D level may actually be the CAUSE of Flu Symptoms in the first place. This theory suggests that the seasonal nature of flu symptoms, almost always in the wintertime, is because of rampant low Vitamin D levels at that time of the year affecting the rate of natural antibiotic production and thus decreasing the effectiveness of the immune system. A newer study, The Role of...Vitamin D in reducing case-fatality rates from the 1918–1919 influenza pandemic... , supports this theory and relates the correlation between sunlight exposure and the rate of death from the flu. It is an interesting point that cold and flu symptoms are primarily wintertime problems. Have you ever wondered why that is? Well, now you might have the answer. "Critics say we should not recommend vitamin D to prevent influenza until it is proven to do so (It has not been). The critics are thus saying, although they seem not to know it, "you should be vitamin D deficient this winter until science proves being vitamin D sufficient is better than being Vitamin D deficient." Such advice is clearly unethical and has never ever been the standard of care." Vitamin D and the flu are DEFINITELY linked, as is Selenium and The Flu. While neither has been PROVEN beyond a shadow of a doubt to be an effective flu treatment or a cure for the common cold, Vitamin D for cold and flu symptoms COULD prove to be a formidable way to combat colds and flu. If you decide to use Vitamin D for cold and flu symptoms, be sure that you read the Normal Vitamin D levels and the Vitamin D requirements page for extensive information on how to take Vitamin D safely and effectively. Do you recommend large doses of Vitamin D3 to help avert colds?